By 2006, I had hunted many of the animals in North America. I wanted to go on a big trip and do something outstanding. As Anthony Hopkins said in the movie The Edge: "I wanted to do something unequivocal." I thought going on a shooting Safari to Africa would qualify as being unequivocal. After careful preparation for the trip, I arrived in Windhoek and went through customs easily. Namibia makes a lot of tourism money from hunters and they make it a mere formality to enter the country. My Namibian trip would be a 10-day safari with Barry as my PH. On the sixth day of my safari, we were going to the Namibian desert. This is the oldest and driest Desert in the world. Although it contains many varieties of animals and can be very beautiful, it can also be very harsh and very deadly. The tallest sand dunes in the world are in Namibia. Some of the oldest plants in the world, the Welwitchia, thrive in the Namibian Desert. The Welwitchia plant can be 1000 years old. The trunk grows into the ground in its search for water and two broad leaves remain on top. The plant can reach heights of seven feet. The Namib Desert in Namibia and Angola are the only places in the world that this fossil plant grows. Desert dwelling Elephants and Rhinoceros have learned to live in the harsh environment of the desert with little food and little water. Some of the largest Springbok in the world inhabit the Namib Desert. We were going to the Desert to hunt these extraordinary Springbok. There was also a chance that I might get the opportunity to harvest a Hartman’s Zebra or Mountain Zebra in the desert. I awoke early that morning, went to the boma and stoked the embers of what was left of the previous night’s fire. I added more wood. Soon the fire was blazing. I listened to the jackals howl and watched the stars wheel overhead while I drank coffee. Later in the morning I harvested a very good Springbok and afterwards we had lunch under a huge Mopane tree. The Springbok steak tasted very good! Barry split the fresh kidneys with his pocketknife and grilled them over the hot Mopane coals. The kidneys were very meaty and tasty. The trackers preferred the Springbok ribs, liberally seasoned. Everyone had plenty of meat. I drank a lot of grape Fanta since it was dry in the desert. The desert was not unbearably hot, just dry. It was so refreshing to sit under the big Mopane tree. After an hour we decided to move. We followed the track deeper into the desert. We came to huge expanses of land that stretched as far as the eye could see. We saw a few small Springbok in the shimmering distance and followed a dry riverbed for miles. We saw Leopard prints in the sand and a flock of Ostrich followed us for miles. We saw some majestic Martial Eagles and Pale Chanting Goshawks floating overhead in the dry desert air. Once we almost got stuck in the soft sand of the dry riverbed. We were following the dry riverbed into the mountains and came to a high plateau and found many Welwitchia plants in the hard rocky soil. Near this plateau, I took another Springbok trophy – a 16” ram: a Gold Medal animal in Namibia!! and yellows of the desert landscape were indescribable with the setting sun bringing out their beautiful palette of colors. We came to a waterhole and many animal tracks were visible around it. Barry found some Mountain Zebra tracks. Mountain Zebra are quite rare in most African countries, but are plentiful in Namibia. If I shot one it would be a real trophy. We came to a series of plateaus with long dried grasses and rocky ground. We saw many herds of Springbok and also herds of beautifully colored Gemsbok. This was perfect country for Gemsbok. The Gemsbok can tolerate extremely high temperatures and can live off the water from the plants that it eats. The tracker and Barry spotted a herd of Zebras. We drove over some unmercifully rocky ground to get close to them. We got to within 450 yards of the Zebras. Barry wanted me to take a shot. He had seen me put ten Namibian animals into the salt with shots reaching to 275 yards and was satisfied with my marksmanship. He thought I could make the shot. I took careful aim, but missed as was evidenced by the Zebra running away at full gallop. I told Barry that I thought 450 yards was too long for me. We drove further up into the mountains where some more Zebras were spotted. This time we got to within 305 yards of the herd stallion. He was standing broadside to me. The setting sun outlined every stripe on his body in detail. The stallion was beautiful!! Barry said to shoot him in the shoulder where the stripes form a perfect triangle for a natural target. I knew that the Remington Cor-Lokt 180 gr bullet fired from my Ruger .300 Win Mag would drop 3.6 inches at 300 yards. I took careful aim with the bipod to steady my rifle. I placed the crosshairs on the triangular spot knowing that the bullet would drop 4 inches and pierce the stallion’s heart. I placed my left hand under my right hand for added stability. I slowly squeezed the trigger. Whuuuumpp! 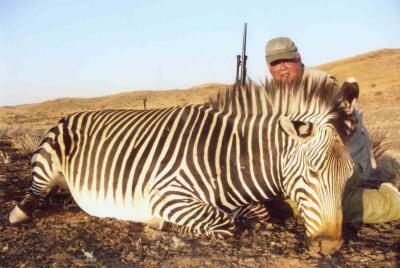 The bullet hit the Zebra solidly. His back legs kicked out and he dropped in his tracks. A magnificent shot!! "Great shot, Captain! Well done!" said Barry. I could hardly believe that I made such a shot on such a magnificent animal in such an exotic location. My Herero tracker, Yassir, smiled at me and asked, "Are you happy?" I replied that I was deliriously happy. He said, "If the Captain is happy, I am happy." So simple, yet so profound. Actually I was in a daze I was so happy. I was on sensory overload from my Namibian experiences. It was a pleasant overload! On the way back to camp we spotted three sway backed, grey colored Namib Desert dwelling Elephants near a waterhole in the gathering darkness. With the harvest of the beautiful Springbok and the magnificent Mountain Zebra, the Elephant sighting was a fitting finish to my superb excursion to the Namib Desert. That night we had a fine meal of Kudu chops. After the delicious dinner which included fresh baked bread and apple crisp, I sat in the Boma before a fragrant Mopane wood fire, smoked a fine Nicaraguan cigar, drank a cold Windhoek Lager, and nibbled on spicy African biltong. I shared stories with my hunting mates, looked into the blazing African sky and saw the Southern Cross in the bright myriad of stars. For me, it does not get any better than this! My next trip to Africa is already booked! Nice Zebra. Story is okay. This story involved all the senses; from the striking photo of the zebra to the descriptions of roasting meat, sunsets, long yellow grass, sensory overload, fragrant burning wood, cold beer, savory food, and starlight. The author had quite an adventure. This is an excellent story. I have not hunted for many years now. Stephen's story stirred up the old hunter in me though. He does an great job of showing the many facets of a hunt in today's overly complex world. I like his mixture of providing sound practical hunting information along with reflective thought. Your adventure truely was a once in a life time experience. I have never seen a zebra that big, only the ones in the Zoo. Man, I've got my own stuff to tell, but this story just tops it off. Everything you wrote made me feel like a Kalahari Bushmen (that means it was real good). I've got a big buffalo head in my bedroom, I'll bet someone like you has something just the same. If you win this trip, you should definitely get an elephant head to hang right over your bed, asssuming you have the money to pay for an elephant. It'd be hard to sneak an elephant head back to America, at least from my experience. You know, grape Fanta is really the way to go. Most of your story I can pretty much relate to, even in an obscure way. But that's not the only reason it was so good; this story was definitely the greatest I've ever heard. Excellent and very great story. IT IS REALLY A WONDERFUL STORY WRITTEN BY STEVE. NOW I KNOW MORE ABOUT AFRICA. FANTASTIC SCENARIES, RARE ANIMALS, PLANTS AND HOW DO THE PEOPLE LIVE THERE TO ENJOY AND SURVIVE IN THESE UNIQUE CIRCUMSTANCES. I FEEL LIKE TO GO THERE WITH STEVE SOMEDAY! Stephan's description of the Namibian desert and animals is great. For a seasoned hunter, this trip would be a dream vacation. And it sounds like relaxing afterwards is just as much fun as the hunt! The descriptions are fantastic. Steve is really knowledgeable about more than just his hunt he knows the geography, the plants, animals, and how to make you feel that you are there. I wish I could see it for myself. I can't wait for your next story. Stephan Hofmann's story is amazing. It is incredibly descriptive and intriguing. I hope that he has many more stories to tell. Even for a reader who does not know much of anything about Africa, this colorful description makes me feel like I'm there. Can't wait to hear about the next trip. Adventure without unwanted stress. It sounds like Namibia is pretty friendly. The people are reasonable. Weather great. Scenery exotic. Hunting great! Maybe an African Safari is possible? Makes me want to go to Africa. I am not a hunter but Stephan's vivid description of his hunt in Namibia makes me want to go to Africa to see all the animals that are there. Its a good story but there is something missing it does not jump out at you. Not only was the narrative of the hunt itself detailed and well crafted, but the description of the desert terrain and life was informative and awe inspiring. I can understand why Stephan is planning to go back. This reading experience was unequivocal! I enjoyed Stephan's clear and concise writing style coupled with his remarkable ability to paint such a wonderfully vibrant picture of his hunting experience. Stephan writes a very interesting story that is easy to visuallize. I like how he describes the landscape and ancient fauna along with the thrill of the hunt. He paints a very real picture that makes me want to pack my bags and head to Africa! Feels like I was there too!! What an excellent story! Great details, I saw the beauty of Africa,interesting details of the land,& certainly felt the excitement of traveling to Africa,preparing for the hunt & the actual accomplishment of it.Does Stephan write for a Travel Magazine? I can't wait to see Africa myself. Mr. Hofmann brought me to Africa. I will never go myself but now I can picture myself on the big safari. Thank you! Very interesting. I enjoyed reading it. Are their pictures of the 16 inch Springbuck? The story was very descriptive from begining to end. I would have wanted to know Steve's hunting equipment.